Life, Laughter and Paris: Thinking of Paris on Bastille Day! 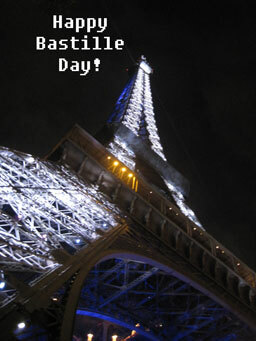 Thinking of Paris on Bastille Day! There’s something very comforting about tradition and continuity which is just another reason I love Paris. I know when I go back, not only will the Eiffel Tower, Notre Dame and the Louvre still be there, but also my favorite haunts from our last 30 years of visits. Harry's Bar will be there (and so will our favorite waiters)! It won't turn into a Gap or Old Navy while I'm gone. The art supply store, the book shop, even Monoprix will still be where I remembered. This is probably one of the reasons so many people feel at home in Paris. (I've been told I know Paris better than Montréal; that I'd be able to find Harry's from CDG blindfolded. I take this as a compliment). The Moulin Rouge opened in 1889 and is still going strong. It’s the Belle Epoque in the shape of a windmill, sitting in Montmartre. Close your eyes and picture Lautrec at a table, sipping absinthe, and sketching one of his amazing posters. The Moulin has been going for 120 years. Jane Avril, “La Goulue” Yvette Guilbert, Mistinguett....and later, Trénet, Aznavour, Ella Fitzgerald…..well the list goes on and on. Over a century of entertainment covers a lot of big names! I know I know.....the Moulin Rouge isn’t what it used to be. Now it’s expensive, a production, and mainly for tourists. But, it’s still there and that makes me happy! I wish I was in Paris for the Bastille Day celebrations but I'll have to make do with web coverage. I've never been to Paris in July, or August for that matter. The only way I'll spend summer in Paris is if I win the lottery and live there all year round! Whoooo! Now that's a thought! A nice post! Keep it coming! Thanks for the visit and nice words! I've been getting laughs from your great blog page :) Nothing like some humor to make us feel good!